There are many church chair distributors to be found on the Internet; most can offer what appears to be outstanding pricing, but what you may very well get is a cheaply manufactured chair from another country. It's important to find a chair that not only looks good but can be built to fit your sanctuary. If you can deal directly with the manufacturer, as opposed to a distributor, it's easier to get chairs that are made to different widths so that each row in a curved or awkward shaped configuration will be the same. Fabric isn't the only option for making a chair aesthetically pleasing, different finishes on the chair frame are usually available. In today's economy, it's difficult sometimes to come up with the money necessary to refurbish a sanctuary. Looking for a chair manufacturer that will offer financing at reasonable rates can be critical. It may seem like a inconsequential thing to look at when shopping for chairs; who's going to see the foam anyway? However, it can be one of the most crucial things to consider. Like the padding placed under a quality carpet, the foam can determine the lifespan of a chair. You need to find a heavy foam that is comfortable but will stand the test of time. It's important to consider not only how the color of the fabric matches your decor but also how well the fabric will hold up to extended use. If your sanctuary is used only for one service on Sunday morning, then an inexpensive fabric might do the trick and last for years to come. However, if you plan on expanding in the future or you already have several services, then it would be cost-effective to pay a little more up front for the fabric and have it last and look good for years to come. The frames on cheap chairs from China are manufactured using a process called crush bending where the tubular steel is bent without any support from inside thus crushing the steel as it's bent. This makes the frame weak. The better option is to look for frames that are manufactured using mandrel bending, where a steel rod is placed inside the tubular steel as it's bent into shape. This is not only important for the strength of the chair but also provides a nicely sculpted look instead of the wrinkles associated with crush bending. Look for options such as communion cup holders, bulletin holders and trays for Bibles incorporated into the seat. While most manufacturers offer these options, it can be advantageous to find one that offers lumbar support and wide backs, as well. This can be important not only in the initial purchasing phase but also later on. Should problems arise, or better yet you need to order more of the exact same chair, it's good to know you have someone you can call and get immediate results quickly without having to hassle with a phone tree. Some chair manufacturers offer only a 5 year warranty if any warranty at all. Look for a manufacturer that offers warranties up to 25 years on their church chairs. What are some fundraising tips to help with the purchase of new chairs? With the economy the way it is today, raising funds for a new church project such as chairs can be daunting. There are several ways raise money to purchase specific items that a church needs to operate. For the sake of this article, we will use church chairs as an example of a large purchase that most if not all churches need to raise funds for. One of the best ways I've seen to raise funds is by having each individual in the church "buy" their own chair. It woks something like this: The church board decides which church chairs would best suit the church's needs and presents them to the congregation. Most chair manufacturers are happy to send sample chairs to potential buyers. Then, the price of each chair along with a picture and descriptions are handed out to each church member, and everyone is asked to donate that amount. In almost all cases, this works very well. Asking for $35 for a fundraiser is much more palatable to people than presenting a bill of $17,500 for 500 chairs. While some people in the congregation won't be able to afford to participate, there are always many others who will buy more than just one. Why is this chair so heavy? Many different components are used in making a church chair. Most manufacturers don't take into account that church seating is often stacked and reset many times during the year for events and banquets. This can cause problems when staff members and volunteers stack the chairs and move them. Nobody wants to suffer from a back sprain due to excessive lifting. Look for a manufacturer that takes steps to ensure a high-quality, strong product but cuts down the weight as much as possible. Other manufacturers use wood, 1 inch tubular steel throughout and excessively heavy foam to make their chairs. Blow molded plastic seats and backs, smaller tubular steel on the backs, and high-quality foam provides support and longevity but is also lightweight. These changes also make church chairs easier to stack and reset. How do you ensure you get the best church chair for its intended use? Look for a manufacturer that is committed to building chairs that are totally versatile and can be used in a variety of situations. Chairs should be made to efficiently stack so that they can be stored in as little space as possible, but they also need to be lightweight enough to be stacked by anybody. Because of the ease in which these chairs can be stacked, they can be used in any situation as a short-term solution. All chairs should be designed with comfort as a main point of focus. 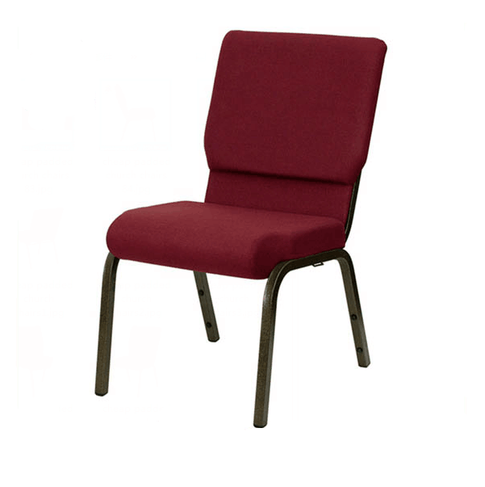 Engineers are constantly researching and using the latest technology to create the most comfortable and longest lasting church chairs the industry has to offer. Every component from the foam to the frame should be designed to enhance comfort to a level previously unknown in church chairs. Chairs should maintain their high level of comfort throughout the life of the chair. Engineers have created a comfortable chair that will not degrade in quality through the wear and tear that occurs over time. The chair you purchase should be at the same level of comfort as it will be throughout the years to come.